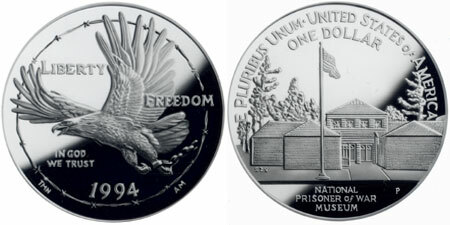 In 1994, the United States Mint issued commemorative coins to pay tribute three groups of American veterans. 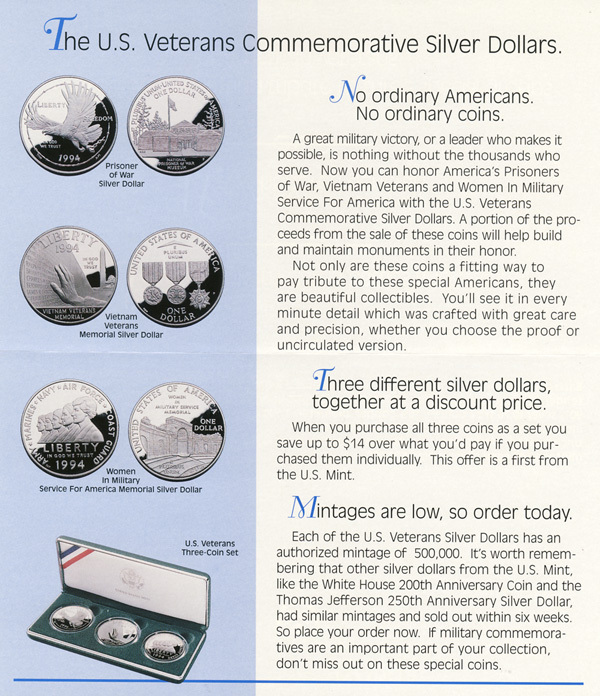 The silver dollars were available individually as well as packaged together as the U.S. Veterans Commemorative Silver Dollar Set. The three coins were the Prisoner of War Silver Dollar, Vietnam Veterans Memorial Silver Dollar, and Women in Military Service Silver Dollar, which were all authorized under Public Law 103-186. The trio of issues came at a time when the number of commemorative coins authorized by Congress and produced by the United States Mint had begun to swell. After issuing just a single commemorative coin in 1990, five coins issued in 1991, followed by seven coins in 1992, seven coins in 1993, and finally eight coins in 1994. The proliferation of issues had begun to result in lower sales for each program and would eventually lead to a limitation of two programs per year after the passage of the Commemorative Coin Reform Act of 1996. 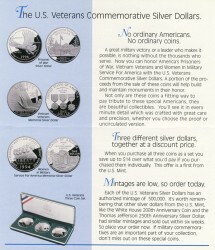 The 1994 U.S. Veterans Commemorative Silver Dollar Set offered the three military themed silver dollars at a discount to the individual prices. 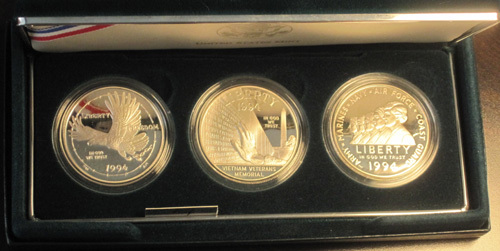 A three coin proof set was available at $91, compared to pricing of $35 for each individual coin. A three coin uncirculated set was offered for $87 compared to pricing of $32 for each individual coin. The Prisoner of War Silver Dollar featured a design by decorated Vietnam veteran Thomas M Nielson (obverse) and Edgar Z. Steever (reverse). On the obervere, a chained eagle breaks free through a ring to represent “Freedom”, while the reverse shows the proposed design for the National Prisoner of War Museum. The total sales reached 54,893 uncirculated and 224,449 proof coins out of the 500,000 maximum mintage. 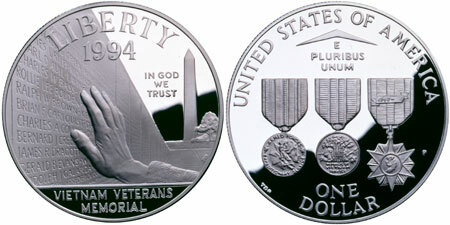 The Vietnam Veterans Memorial Silver Dollar was designed by John Mercanti (obverse) and Thomas D. Rogers Sr. (reverse). The obverse shows an outstretched hand touching a name on the Vietnam Veterans Memorial and the reverse depicts three medals awarded during the Vietnam War. Sales across all available options reached 57,290 uncirculated and 227,671 proof coins out of the 500,000 maximum mintage. Lastly, the Women in Military Service Silver Dollar was designed by T. James Ferrell (obverse) and Thomas D. Rodgers Sr. (reverse). The obverse carries profile portraits of servicewomen representing the five branches of the United States military. 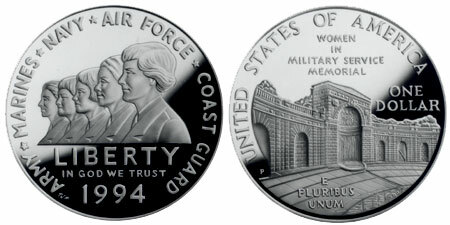 The reverse depicts the approved design of the Women in Military Service for America Memorial. The final mintage reached 69,860 uncirculated and 241,278 proof coins out of the 500,000 maximum mintage. This is totally off-topic but I just wanted to note that an article on news.coinupdate.com is cited in the President’s proposed 2013 Federal Budget. I have a silver commemorative Vietnam veterans memorial coin with an eagle flying with arrows and leafs over a shield on one side and the other the Washington memorial, it’s a .900 silver. How real is this coin? And it is real silver?